Note: Attaching documents is similar to adding lyrics, but not the same. You can use this comparison chart to understand the differences. Click the Edit button for a song, event, contact or transaction. Click the Add Document button. Change the document orientation to Landscape if needed; this helps the app display the document correctly. If your document is too large to sync over the Internet, click the Copy To Devices Manually option. Then you can install the document directly on your devices. If you only want some users to see this document, select the desired users. Click Save. Now the document will upload, the popup will close and the document name will appear on the edit page. You can repeat these steps to add more documents, then drag and drop to rearrange them. Then click Save on the edit page. Zip your documents together into a file up to 500MB in size. Log into the website and go to the Documents page of the Repertoire, Schedule, Finance or Contacts section. To only attach documents to existing songs, leave Add New Songs deselected. 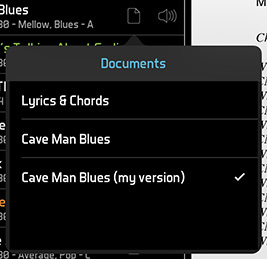 To create new songs for any documents in the zip file that don't match an existing document or song name, select Add New Songs. Replace existing documents that have the same name. Attach new documents to a song, event, transaction or contact with the same base name. For example, a document named "Freebird - horns.pdf" will be attached to a song named "Freebird." Add a new song (or event, transaction or contact) for any documents whose names don't match any existing items, if Add New Songs is selected. View the document from another app on your device and look for the "Open in..." command. For example, if someone emails you a document as an attachment, you can tap the document from the email message, then tap "Open in..." and choose BandHelper. You can also find the "Open in..." command in file sharing apps like Dropbox and word processing apps like Documents To Go. Unfortunately, Pages does not support this feature; to copy a document from Pages you would have to email it to yourself, then use "Open in..." from the email message. This method only lets you copy one file at a time. In iOS, tap the Import button at the top of the Repertoire > Documents list and select documents to import from other compatible apps. This method only lets you copy one file at a time. In iOS 11 and above, open the Files app and browse to where your documents are stored in another app or cloud storage account. Click the Select button and select the documents you want to copy, then click the folder icon and select On My iPhone/iPad/iPod > BandHelper. Copy documents to your device with the file sharing feature in iTunes. With your device connected, select it from the device button in the top toolbar of iTunes; then click File Sharing in the left sidebar; then scroll down in the Apps list and click BandHelper; then drag documents into the list. After copying your documents into the app, you can navigate to the edit page for a song, event, contact or transaction and follow the same steps for adding from the website, above. Adding documents from the Android app works similarly to the website, but you must first copy the document to the directory the app is reading from. By default, this is /Android/data/com.arlomedia.bandhelper/files. If you prefer, you can set a different directory in Settings > Account Sync > File Download Directory. After copying your files into the correct directory, you can navigate to the edit page for a song, event, contact or transaction and follow the same steps for adding from the website, above. After you've attached a document to a song, event, contact or transaction, you should see a document button appear next to that item whenever it appears. Clicking the button opens the default document, which is the first one in the list for that song. If you have attached more than one document, you can hover over the button until a submenu appears, then click the desired document name. Scroll up or down to change pages in a multi-page document, or click the right or left arrow buttons to view additional documents or lyrics attached to the same song. Click the +/- buttons in the viewer toolbar to zoom the document in or out. Tap the download button in the viewer toolbar to save a copy of the document to your computer. After you've attached a document to a song, event, contact or transaction, you should see a document button appear next to that item whenever it appears. Tapping the button opens the default document, which is the first one in the list for that song (unless you change Settings > General Settings > Defaults > Document). If you have attached more than one document, you can tap and hold the button until a submenu appears, then tap the desired document name. 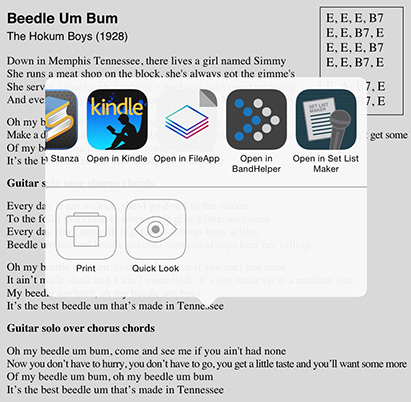 Swipe up or down to scroll through long documents, or tap the top or bottom third of the lyrics to snap to the previous or next page. Pinch to zoom the document in or out. 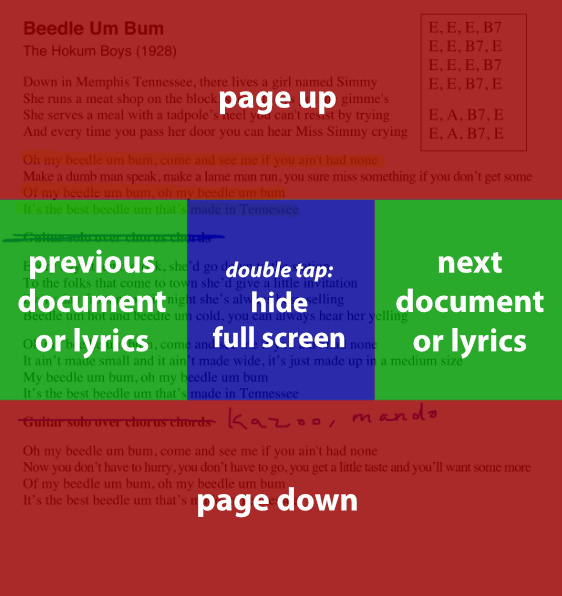 Tap the left or right third of the document to switch to adjacent documents, if multiple documents are attached to the same song. Double-tap the center of the document to expand it to full-screen view. Double-tap again to exit the full-screen view. Tap the document tools button in the top right corner to save the current zoom level (for PDF files only), reset the zoom level, add or save annotations, add markers, change the Fit to Height setting or toggle in and out of full-screen display. From the annotation toolbar, select the pen, highlighter, text and whiteout tools to write directly onto your document. Select the eraser tool to remove individual annotations, or double-tap the eraser to remove all annotations. While adding annotations, you can scroll the document with a two-fingered drag. To add markers, scroll the document to the desired position, then click Add a Marker in the tools menu and enter a name for the marker. You can also click an existing marker to rename or delete it. When your document contains markers, all the next page and previous page functions (including the on-screen hotspots, automation events and remote control actions) will jump to the marker positions instead of the page positions. From a set list only: If an arrow appears in the document icon, tap it to begin auto-scrolling. The iOS app can display .pdf, .doc, .docx, .ppt, .pptx, .pages, .key, .rtf, .txt or .jpg documents. The Android app and website can only display .pdf, .txt and .jpg documents. Word (.doc and .docx) and RTF files have black text by default, so if you view a Word or RTF file in BandHelper, the app will place a white background behind it so you can read the text. If you want to use a dark color scheme, you can edit your file to use white text on a black background, then change BandHelper's Settings > Appearance > Word Document Colors option to Inverted so it won't place a white background behind it. Plain text (.txt) files always have black text, so BandHelper will always place a white background behind a text file. The iOS framework for rendering documents doesn't always size Word and Pages files correctly on the screen. If you find that your documents are showing with two pages in BandHelper but they should only have one page, this might be the problem. If you convert your documents to the PDF format, they should always be sized correctly. To display documents correctly, BandHelper needs to know the size of your documents. You can tell BandHelper whether you're using A4 or Letter documents on a database-wide basis with the Settings > General Settings > Document Size option. You can also tell BandHelper whether your documents are portrait or landscape orientation on a document-by-document basis: tap the Documents menu item in your database, then tap the Edit button for each landscape document, select the Landscape option and save. BandHelper assumes documents are portrait oriented, so you only need to do this for your landscape documents. You can display your documents in two columns if you edit your layout, tap the document viewer, tap its options button in the top right corner, and set Content to 2 Columns. Then tap the document tools button and select Fit to Height to display two pages side by side. If you are using an external display with an iOS device, that display will mirror your entire screen by default. Alternatively, you can set Settings > General Settings > External Display to Document, and then the external display will only show the document when you view it from within a show. Your show layout does not need to include a document viewer to use this feature, so you could view a list-only layout or other information on your device display and a document on your external display. The iOS "Open in..." command doesn't work in the Photos app in iOS. However, you can save JPEGs to your photo library, then tap the Photos button in the Add Documents window in BandHelper, and select the photo from the photo library. If you have created your document by scanning a piece of paper, the file size will be relatively large, which will make the document open slowly when you view it within the app. The best documents are created from an electronic source such as a Word or Pages document. If you don't have an electronic source, you can experiment with your scanning settings to minimize your file sizes. Most documents can be scanned in black and white, with 100-150 dpi for regular displays or 200 dpi for Retina displays.